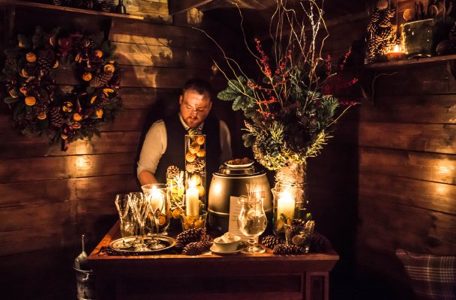 Situated in the Courtyard of Gordon Ramsey’s York and Albany is the winter cabin, an alpine ski lodge experience serving festive cocktails and canapés. The picture of winter chic, located on a quiet corner of Regents Park, you would never guess this hidden gem was mere minutes from the mania of Camden tube. We took the Northern line from Bank to Camden, sweaty as always, I thought to myself. If this was a first date, I’m pretty sure I have been closer to most people on this tube than dates I have been on of late. I went with Hannah, a colleague who had started in my team the week before. She is amusing, likes food and at the end of a long working day is still good company, needless to say a great partner for dining. We arrived and were politely shown through to the courtyard. The York and Albany is lovely, like a drawing room; it is cosy and welcoming without an air of pretention. Upon arrival we were met by a knowledgeable and enthusiastic mixologist who advised that we must experience the cocktails in order; as condescending as this sounds, he was not at all. The cabin was full as we arrived, so we stood outside and quickly removed our coats. It is incredibly well heated, only adding to the rustic charm. The first cocktail was called The Opportunist. It was bourbon based, served in a tall glass and smooth, creamy and well seasoned. The second drink was a cherry based cocktail; delicious, warm, sweet and tasted like Christmas in a cup. Aptly named The Rumond, you could taste the Disaronno, Bitters and Bacardi, all equating to a sweet, sharp, cherry coloured cocktail. As we drank, the waiters circulated venison burgers and game scotch eggs, both perfectly cooked in the York and Albany restaurant kitchen. The venison burger was deliciously gamey and still pink in the middle; it took all of my will power not to go back for thirds. This was followed by what was described on the menu as a black pudding scotch egg. Although this was something that I can’t say seemed immediately appealing to me on paper, I was so pleasantly surprised. The crispy breadcrumbs, gamey black pudding and soft yolk made for a scrumptious mouthful, filling my mind with warm, cosy and Christmassy thoughts. The introduction to our desert was the sweet smell of toasting marshmallows, and if we thought it couldn’t get any more festive we were wrong. The waiter appeared with a rich buttered Bacardi hot chocolate. Need I say more? As we wandered out feeling content, happy and better friends, we realised it was obvious that this was a perfect option for a festive get-together treat with friends, family, colleagues or anyone who likes an evening of Christmas indulgence. It was also a reminder that we should be excited that the season of indulgence, good food and spending time with friends and families is upon us, rather than a fear of Oxford Street’s early decorations and the fact that you’re not that person who has started and finished their Christmas shopping.